This Holocaust Memorial Day – 80 years since the start of World War II – the protest remembers the thousands of LGBTQI+ who perished during the Nazi Holocaust and the millions of Queers across the world who have been killed or brutalised since. 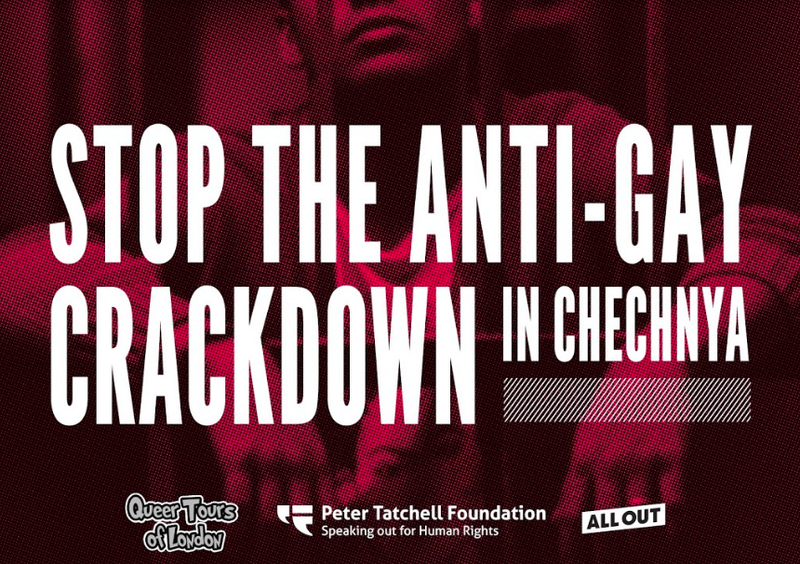 The protests immediate focus is to act for those who have been killed, detained and tortured in a new crackdown on LGBT+ people in Chechnya. The reports earlier this month echo those that started in 2017 and haven’t stopped since. Hundreds of people were rounded up because of their sexuality or perceived sexuality by authorities in Chechnya and subjected to beatings and electric shocks in secret prisons, provoking international condemnation and sanctions. Worryingly, verified reports from the Russian LGBT Network suggest three people have been killed in recent weeks. ‘The news of a new wave of anti-gay persecution in Chechnya is deeply disturbing. Silence is complicity. All world leaders, including the UK Prime minister, must condemn these atrocities and ask Russian authorities to bring those responsible to justice.’ Matt Beard, Executive Director, All Out.